Henderson is the absolute master of the offcut and this recipe is from his inspiring book, Nose to Tail Eating (Bloomsbury; £16.99). It encapsulates everything that's wonderful about slow-cooked food. 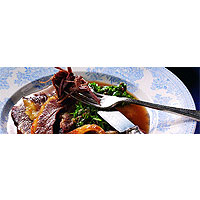 It's fantastically easy, made from simple ingredients and utterly superb when made with a well-produced piece of beef. Brisket - a cut from the from the underbelly - is sold boned and rolled, which is ideal for pot-roasting in a small amount of wine or any other liquid. Henderson salts his in an easy brine before being pot-roasted for 3 hours, resulting in a beautifully flaky texture. Place all the ingredients for the brine together in a large saucepan large enough to contain the beef, but small enough to fit in the fridge. Bring to the boil, so the sugar and salt dissolve. Allow to cool. When cold, add your meat, and leave it in the brine in the fridge for 5 days. Preheat the oven to 170°C, gas mark 3. On the base of a deep roasting tray, just large enough to accommodate the beef, lay your chopped vegetables, garlic, herbs and pepper. Remove the beef from the brine and rinse it under cold water. Lay it on top of the vegetables. Heat up the stock and wine and pour over the meat. Part of the beef should be covered, but not all of it. Cover with tin foil. Put in the oven for 3 hours until the meat is thoroughly giving but is not collapsing. Keep an eye on it: don't let it cook too fast, and turn the oven down if it is. While the meat is cooking, make the green sauce. Chop the herbs finely and mix with the remaining ingredients. Add the olive oil to reach a loose but spoonable consistency. Taste, and season with black pepper. Slice the meat and ladle a little of the juice over. Serve with a little of the green sauce. The herby sweet sauce needs crispness and fruit. A good modern Beaujolais is ideal.